Through value judgements based on the customer’s perspective, the Group maintains financial soundness and aims to improve corporate value to continue providing high-quality services that contribute to customer security, health, and wellbeing. 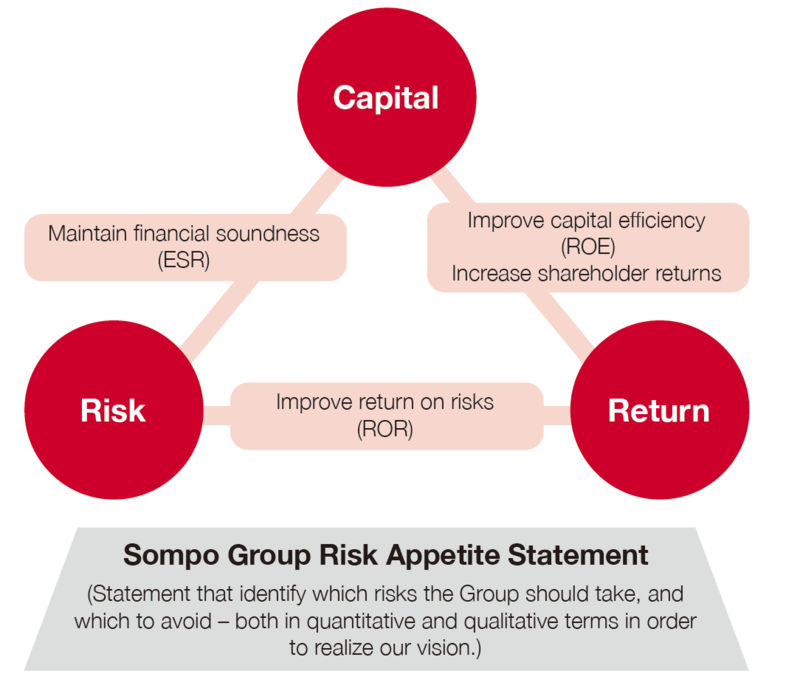 With the aim of maximizing Group corporate value, SOMPO HOLDINGS engages in Strategic Risk Management* to improve profitability against risks, augment capital efficiency, and ensure financial soundness through the appropriate control of capital and the risk-return balance. Strategic Risk Management is used to identify significant risks from a variety of sources throughout the Group, which has established an integrated risk control system to analyze, assess, and control risks while maintaining the ability to accurately respond to risks when they occur. Our ERM framework is referred to within the Group as Strategic Risk Management.